In 2016, total income was NIS 5.6 million; total expenses were NIS 5.3 million. According to its website, donors include Spain (AECID), European Union, United Kingdom (British Consulate General), Misereor (Germany), Trocaire (Ireland), Norwegian Church Aid (Norway), Kerk in Actie (Netherlands), Church of Sweden, Foundation for Middle East Peace (US), Caritas Belgium, and New Israel Fund. Based on financial information submitted to the Israeli Registrar of Non-Profits, in accordance with the Israeli NGO transparency law, RHR received NIS 3.2 million from foreign governmental bodies in 2012-2016. RHR partnered with Caritas International (Belgium) in 2015-2016 for a €125,671 project “La campagne des oliviers” (the Olive Tree Campaign). In 2008-2016, the New Israel Fund (NIF) authorized $1.6 million for RHR (2008, 2009, 2010, 2011, 2012, 2013, 2014, 2015, 2016). RHR partners with the Ecumenical Accompaniment Programme in Palestine and Israel (EAPPI). EAPPI promotes BDS campaigns and utilizes demonizing rhetoric accusing Israel of “apartheid,” “collective punishment,” and “war crimes” (further details below). RHR is active in the international campaign in the complex political conflict over Susya, funded by a number of European governments. Some of the RHR activities in this conflict were undertaken in cooperation with EAPPI. Arik Ascherman, former President and Senior Rabbi of RHR (1995-2016), left following “organizational differences,” and formed Haqal – United in the Defense of Human Rights, an NGO aimed at “challenging land confiscation in the occupied territories and advocating for Bedouin rights in Israel.” In August 2017, Ascherman left Haqal to form another NGO. On June 14, 2017, RHR, with 16 other NGOs, sent a letter to the Attorney General requesting that he “direct the cabinet to immediately rescind its decision” to reduce the electricity supply to Gaza, claiming that it “contravenes Israeli and international law.” This was part of the ongoing NGO campaign attacking Israeli policy in Gaza. On January 11, 2016, Israeli investigative news program “Uvda” aired footage of Ezra Nawi, a radical activist from the NGO “Ta’ayush,” receiving a check for NIS 1359.36 from RHR. The video also featured an expose showing Nawi and B’Tselem employee Nasser Nawaja discussing informing the Palestinian Authority security services about a Palestinian man who allegedly intended to sell land to Jews in the West Bank. The sale of Palestinian land to Israelis is punishable by death under Palestinian law, and according to Nawi, suspects are tortured and then killed. Produced a 2013 film, “Fiddler with no Roof,” comparing Israel’s plan to resettle unrecognized Bedouin villages in the Negev to the expulsion of the Jews during the antisemitic Tsarist regime. Published a 2010 position paper, together with Adalah, Association for Civil Rights in Israel, Bimkom, B’Tselem, Gisha, Public Committee Against Torture in Israel, and Yesh Din, opposing Knesset legislation on transparency in foreign governmental funding to NGOs saying the “Israeli government has sought to undermine the legitimacy of human rights groups” and seeks to impede the democratic process. In response to the 2009 Gaza war, RHR launched a website, with Adalah, ACRI, B’Tselem, Bimkom, Gisha, Physicians for Human Rights-Israel, Yesh Din, and others, that collected “testimonies” accusing Israel of war crimes and violating international law. The violent events in the unrecognized village of Umm Al-Hiran highlight the way in which NGOs intensify conflict between the Bedouin community and the State of Israel, all while being financially backed by European governments. 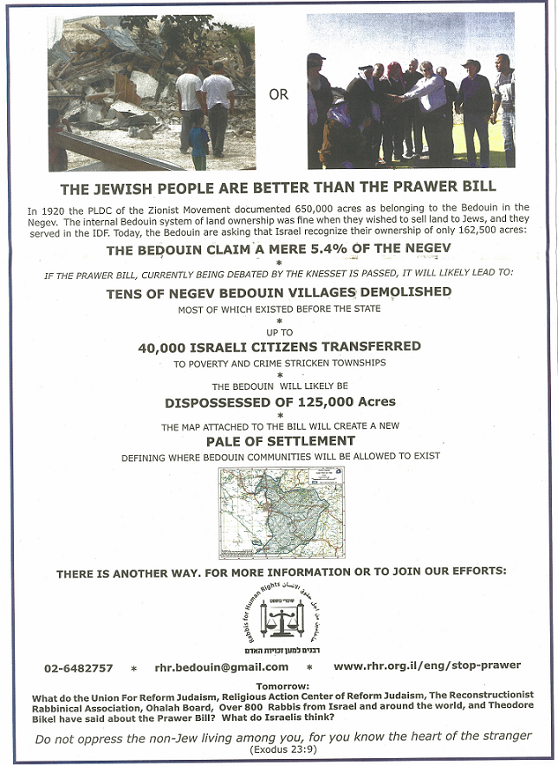 The involvement of political advocacy NGOs in the issue over Bedouin citizens and land claims in the Negev contributes significantly to the demonization and delegitimization of Israel.